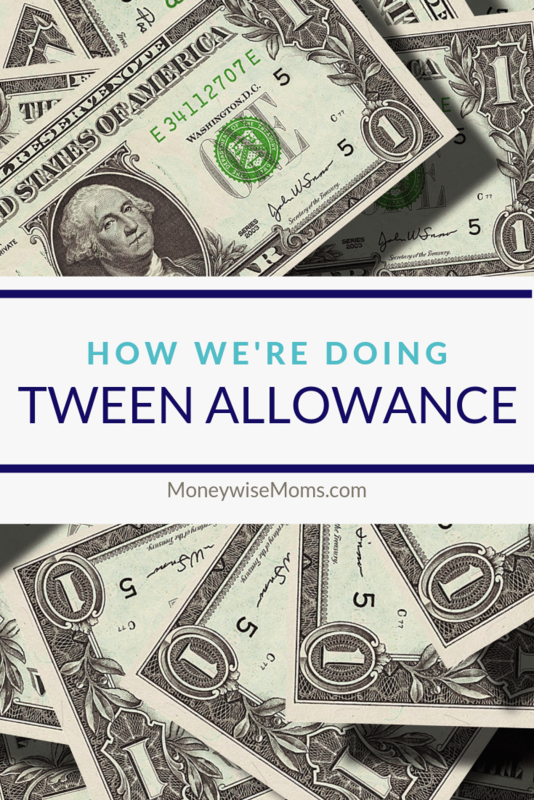 About a year ago, we changed how we did tween allowance. We moved our son from a traditional $-per-week model to a more real-life structure that we’re calling the salary method. Our goal is to teach him how to manage his own money a little at a time, so he’ll be ready to do so independently in the future. And that future seems to be coming up fast! 10% goes directly into savings. He collects this and deposits it into his student savings account at our credit union. 10% goes directly into giving. Once per quarter, he decides where to donate his money. Over the year, he’s contributed to the Leukemia & Lymphoma Society, used the money to buy Toys for Tots, and donated to a local food bank. any other “extras,” like the class Tshirt, souvenirs when we’re traveling, etc. What I love about the salary method is that it shifts responsibility off the parents and onto the child. Each year, the salary is raised and it’s expected to cover more wants and needs. Usually allowance covers lots of “wants,” like the ice cream truck, video games, etc. 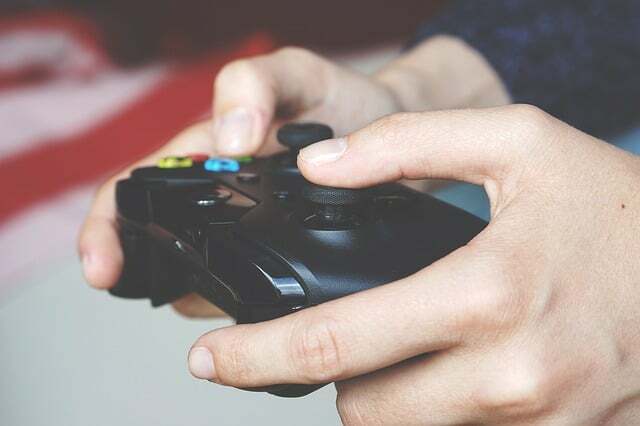 But as the child grows into the teen years, adding real expenses like haircuts, clothing, shoes, school supplies, and others teach him about budgeting, managing money, saving for the short- and long-term, and more. Our previous method, the traditional $$-per-week, didn’t allow our son to make mistakes (and learn from them) or make spending decisions that really mattered. By the way, a tween or teen won’t want to split their money with a childish piggy bank, so consider buying magnetic cash envelopes. Then, they can organize their funds similar to how many of use separate cash for budget categories. Right off the bat, our son did we thought he’d do. He spent his first “paycheck” within two days of receiving it. It was hard not to say anything, but I held my tongue. Two days later, he was invited out to the movies with a friend–and he had to say no, because he had no money to spend. Real life, right? That lesson was learned quickly, and since then he always keeps a little aside for unexpected expenses that come up, like a birthday party invitation or outing. We explained how he was responsible for his haircuts and that not doing them wasn’t an option. The first time he paid for his own haircut, he was unhappy with how much he spent, complaining that it was too much of his monthly amount. Rather than increase his paycheck, we talked about ways to spend less. He could wait 1-2 weeks longer between cuts if he didn’t mind messy hair, he could look for coupons or sales, or he could find a barber that charged less. He ended up asking some friends where they got their haircuts and trying a barber one recommended. Not only did his next haircut cost $8 less, it included a hot towel and neck massage. He was very happy. When we began the salary method, we explained that even though he’s responsible for paying for his own entertainment (books, apps, music, video games, etc.) he still had to follow the family rules. He still has to have permission to make purchases, and he still has to follow our phone rules (our Tween Phone Contract). The salary method has been a good fit for how we’ve talked about our kids growing into paying for their own clothes & shoes. Right now, we set an amount to spend (such as $30 for new sneakers), and our son has to spend his own money should he prefer something that costs more. The first time, he gladly spent a little more for the Nike sneakers he really wanted. But as he’s been saving his money for larger purchases, he has been less interested in spending it on shoes. This has opened up a lot of discussion about durability, cost vs. value, and taking good care of your things, all important lessons kid consumers need to learn. This was another learning opportunity. He was headed to a friend’s birthday party and wanted to know an alternative to spending money on a gift card. He really thought about what his friend liked and put together a bucket from Target’s Dollar Spot filled with her favorite things, which was more meaningful and cost him less than he’s originally planned. This is a technique I had used for years (like my art gift), but again, he learned more by experiencing this with his own money. Overall, my husband and I are really happy with the salary method of tween allowance and the growth we’ve seen in our son over the past year. But what does he think? He says he likes it, mostly because it’s “more money.” And it may seem that way to him, but I don’t find that we’re spending any more than we were before. The difference is that now the control is in his hands instead of ours. I appreciate having a set number on my monthly budget for his allowance and having an easy answer (no) to anything extra. So far, so good. 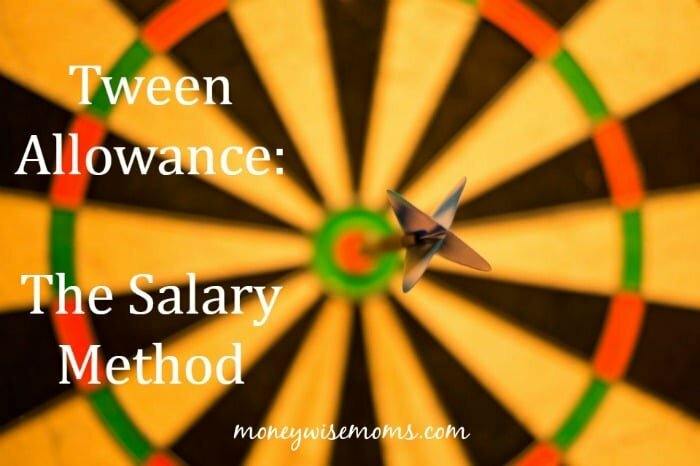 Want to try the salary method with your tween or teen? 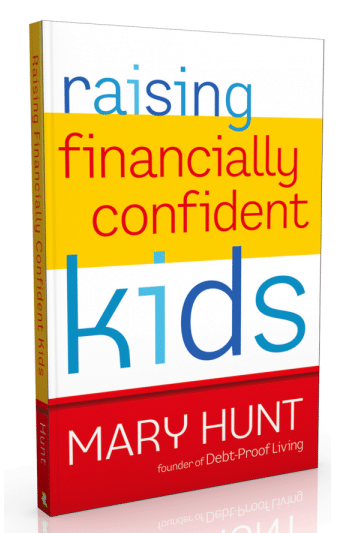 I recommend you read Raising Financially Confident Kids by Mary Hunt. Pick it up at the library or use my affiliate link to buy it at Amazon (thank you!). 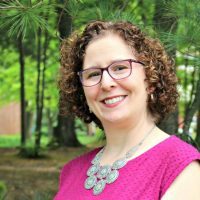 Hunt not only outlines how she implemented this system with her two sons during their teen years, but she explains how to come up with a reasonable starting salary and how to deal with changes through the young adult years. I plan on following her suggestion to increase the paycheck amount and responsibility list around my son’s birthday each year. By high school, for example, he’ll have more responsibility over clothing purchases, buy his own toiletries, and transportation costs. We’ve already talked about how his accumulating savings account will be used for gas and car insurance expenses when he begins driving. This concept is very abstract to him right now, but he’s learning about compound interest and why he needs to save up spending money for larger purchases rather than dip into his bank account (just as we do as adults). And he’s doing it! Hunt also shares how using the salary method worked differently with her younger son. I’m not surprised; I know that in our house, my girls tend to watch their older brother forge the path and go through the trial and error, and they occasionally make choices based on his experience. My daughters are definitely watching their older brother. They’ve already asked when they’re going to start the salary method with them. For now, we’re keeping our twins on the traditional allowance model. We plan to switch them over to the salary method when they turn 11 next year. Oh–and because you may be wondering–we don’t link house chores to allowance. My kids each have a chore for the week: laundry, bathrooms or kitchen which rotates on our chore chart and then they do extra things as asked. We use allowance to teach them financial responsibility, while we see chores as necessary as part of our family team. 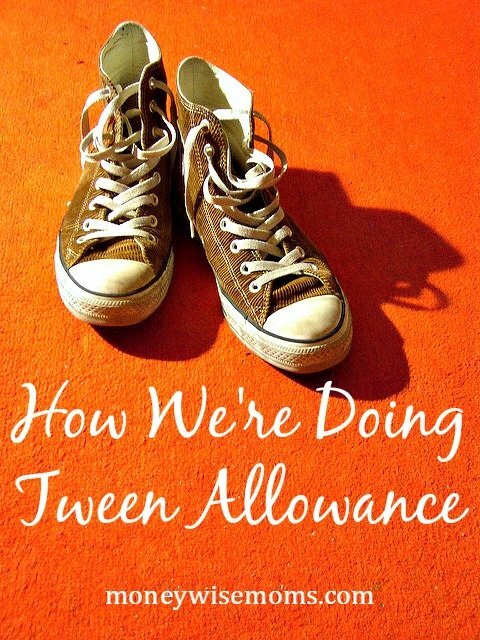 How are you doing tween allowance? I like this a lot! It’s very similar to what we’re doing, but we haven’t tacked on the responsibilities for own purchases. I will definitely do that. We have “work” that has to be done and if the kids want certain things, they need to save up for them and so on. I like the idea of increasingly shifting purchases to the kids. My oldest is 13 and she would learn a whole lot from this. Thanks! Sounds like you’re off to a great start. Thanks for this post! Just this week I was thinking about this. I wanted to increase the allowance of my 2 older children so they can spend their own money on entertainment, etc…, and your post and the book look like they will be great resources! My oldest gets paid weekly with a percentage going into a savings jar and a charity jar. I think as the amount of money she makes goes up we’ll look into actual savings accounts for these things, but for now the jars work. I love the idea of shifting some of the responsibility of purchases towards your tween. 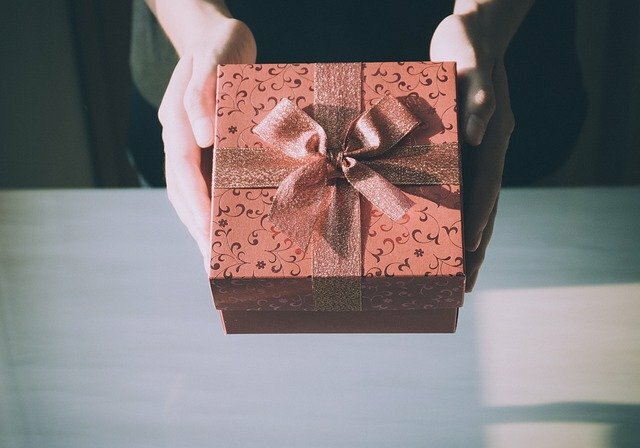 It’s so easy for them to think nothing of something like a birthday gift when it’s mom and dad’s money they are spending. She’s 8 now so probably in the next few years we’ll start moving in that direction. That’s what I’ve seen happen, Catherine, that he’s paying more attention to what he spends the money on because it’s his own. I like your method. We started out by giving the girls the amount in their age each month. They have learned to save for the things they want. They aren’t responsible for clothing and hygiene products, but they do know the value of shopping within a budget. Thanks for sharing! You’ve given me something to think about. That’s how we started, too, and are basically doing that with my 9yo twins. I like how you are teaching your son about the value of a dollar, and how to manage his money – that is great. Thank you for sharing! I love this idea! Question. Do they just automatically get the whole $45 every 2 weeks? Or do they have to do so much “work” or behave a certain way to get that money? Just like a paycheck, if we don’t work, we don’t get paid (usually). So do they just automatically get paid or do they have work to do for it? Great question! My son gets the allowance every two weeks and it is NOT tied to chores. All of my kids have chores each week that have to get done. We tried tying chores to money years ago, and then they would say, “I don’t need or want the money, so I’m not doing the work.” Nuh uh. Not in my house. So now everyone does work because we all live together and help each other. The book talks about taking money away (like a fine) for breaking rules, etc. which hasn’t been an issue for us yet. But I can see going that direction as he gets older.